JOIN THE SIT STAND REVOLUTION IN STYLE with the touch of button. A simple touch raises or lowers your desk to the perfect height, so you’ll be able “sit to stand” for much improved health. ENGINEERED FOR PERFECT POSTURE to keep your spine aligned in any position. Quiet but powerful electric motor allows you to go from seated to standing and back at the touch of a button. BOOST PRODUCTIVITY & FEEL ENERGIZED while you work. The American Heart Association recommends you stand up every 30 minutes to increase longevity. MINIMALISTIC STYLING makes any room shine whether it’s a modern work place or traditional home office. SUPERIOR QUALITY- If you know LEVO, then you know this desk is built to last. We’ve been in business for over 20 years for a reason. 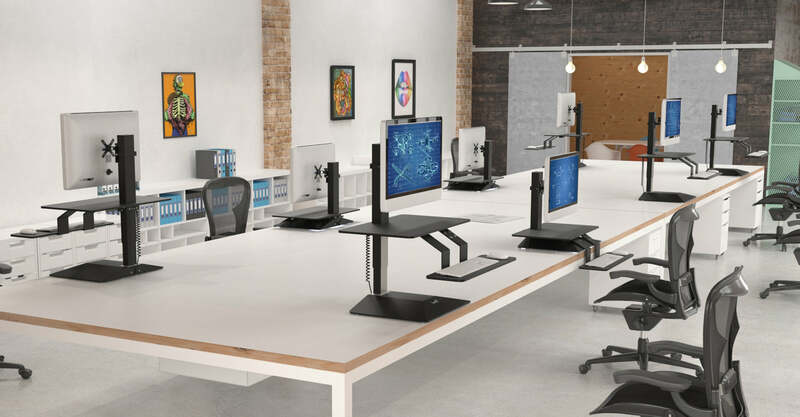 PERFECT FOR OFFICE OR HOME – it’s the ideal solution for offices looking to implement a large scale Sit Stand solution, or for individuals looking for a home office solution. A simple touch raises or lowers your desk to the perfect height, so you’ll be able “sit to stand” for much improved health. Standing at your desk for more than 3 hours a day may reduce your risk of cancer, obesity, and diabetes, and it may add years to your life. The American Heart Association recommends you stand up every 30 minutes to increase longevity. Alternating between sitting and standing throughout the day has been shown to have cognitive benefits like improved focus and increased energy. 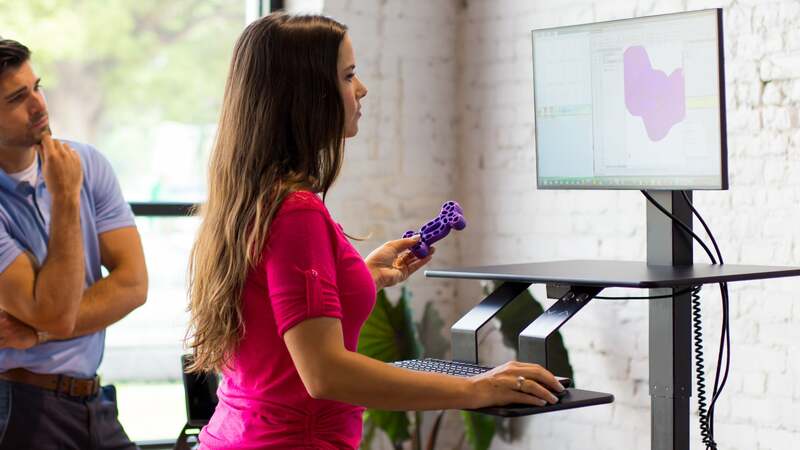 With your LEVO Sit To Stand Desk Topper, you’ll go from sitting to standing with ease. It’s the ideal as a home office solution for Sit Stand working. Its MINIMALISTIC STYLING makes any room shine. Whether it’s a modern work place or traditional home office, LEVO Sit Stand Desk Topper looks great in any room. It’s sleek, reserved, and timeless aesthetics blend with almost every setting, while its modern mechanics dazzle you with every touch of the buttons. It’s the ideal solution for offices looking to implement a large scale Sit Stand solution. Your workers will thank you with more productivity, better health, and plenty of smiles. Contact us today to discuss your commercial office space. Keep your spine aligned in any position. Quiet but powerful electric motor allows you to go from seated to standing and back at the touch of a button. Adjust the height, tilt, and rotation of your monitor to ensure perfect position and comfortable arm placement in every position. Special keyboard bracket extends out and down keeping keyboard tray at standard height when seated or standing. In Sitting Position, your keyboard’s height will match that of standard keyboard shelf. This is an important feature! It keeps your keyboard at the standard height for use with your chair. Our special monitor bracket is height, tilt, and rotation adjustable for perfect position. 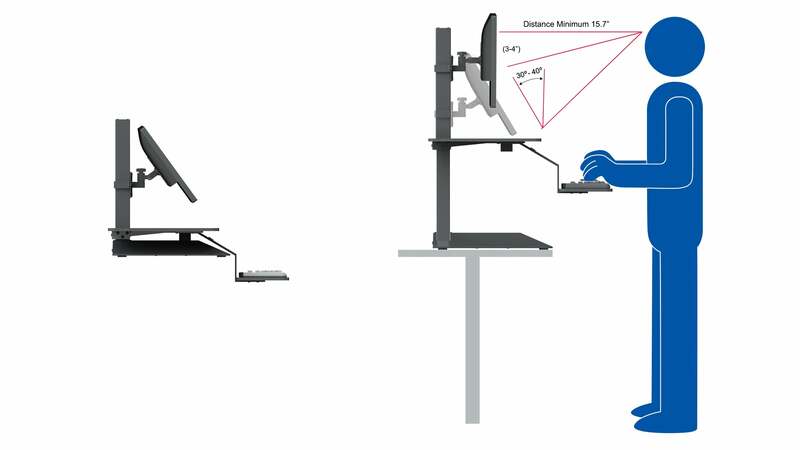 Once the height is locked, you can freely move the tilt and rotation of your monitor. 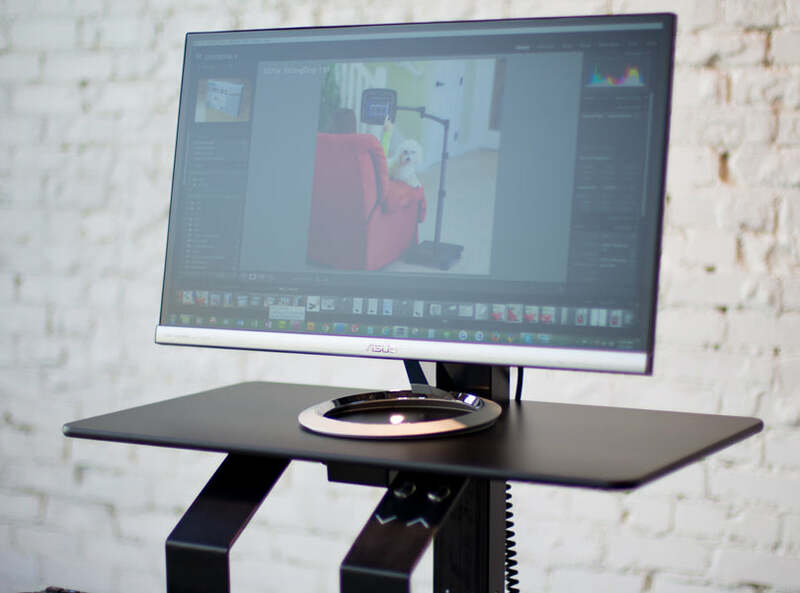 or set your monitor stand directly on the LEVO Sit Stand desk top. VERY NICE FOR LAPTOPS. Attach a keyboard, and mouse to your LAPTOP and you’ve got a nice workstation. Add a monitor, and you’ll have a complete workstation! Touch sensitive buttons for effortless height adjustment. Simply touch the up or down button to adjust the height. 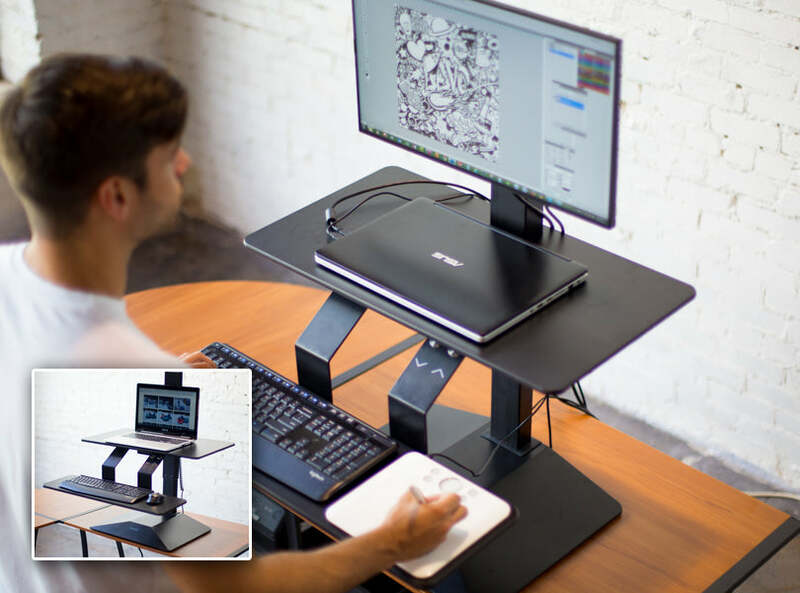 This LEVO Sit Stand Desk is electrically powered with powerful yet quiet motors. You’ll be able to go from sit to stand quickly and effortlessly to improve your health at your desk. How do you assemble the delux ipad stand? Assembly instructions are included in the box. If you need any assisstance, please contact us by phone: 1-800-928-2322 or email: sales@levostore.com. Our office hours are Mon-Friday from 8-4 EST, excluding weekday holidays. What are the maximum weight and dimensions for a monitor attached by visa mount? Thank you! 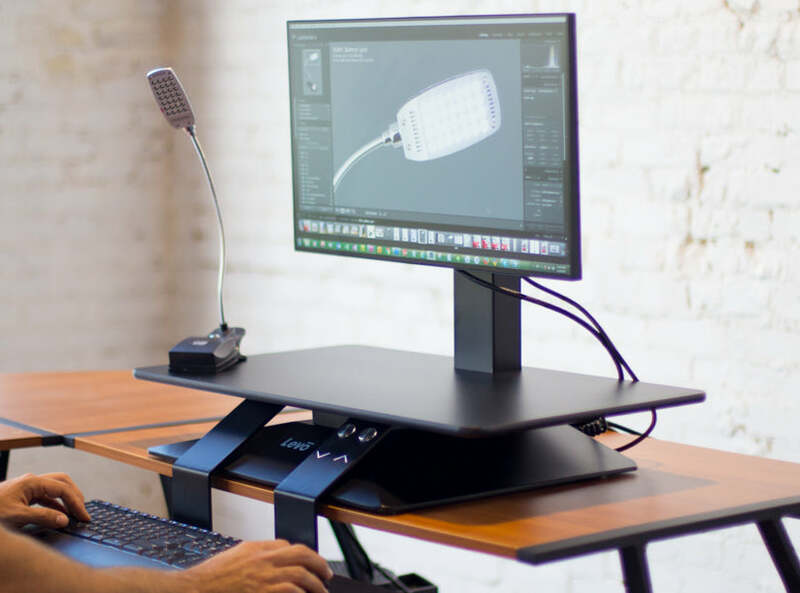 The LEVO Standing Desk with Power Lift can support monitors up to 24" and 40lbs. From the specs, it appears that the monitor mount, desktop and keyboard height can all be adjusted separately. Is that correct? Thanks! Great question. 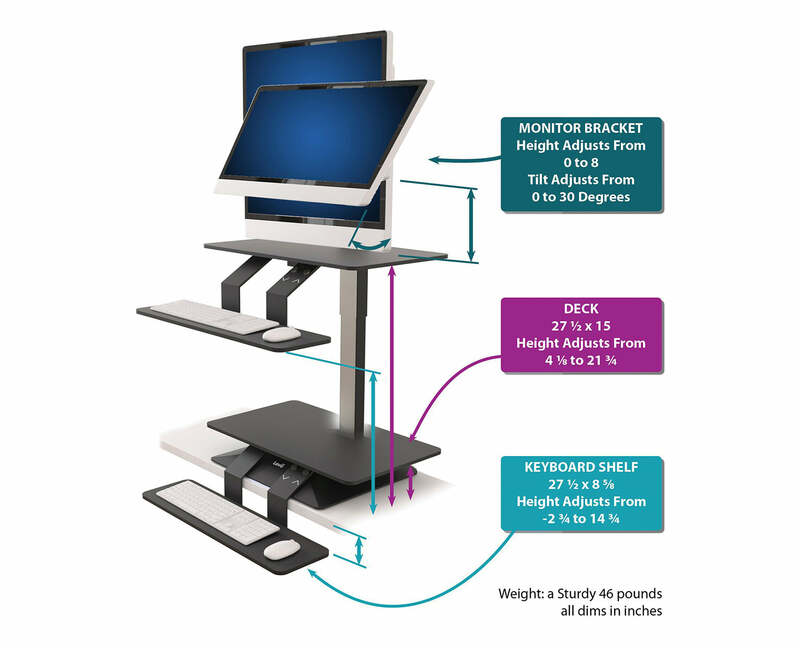 They keyboard shelf on the the LEVO Standing Desk Topper is attached to the deck, so they can not be adjusted independently but they do adjust independently to the monitor. Great option to increase my productivity without having to replace my entire desk. This has been a great addition to my work space. I am amazed at the quality of the construction and the materials used. The unit is very stable and extremely sturdy. They have definitely developed this with a focus on people actually using the product. The motor drive is very smooth and extremely quiet. I was able to mount my 34" curved monitor to the top bracket without any issues. One of the concerns that I had going into this was how stable would the work surface be as I press pretty hard when I type. This hasn't been an issue as the unit has enough weight to be very stable. With the convenience of the motor drive from sitting to standing, I find that I am more productive and have more energy during the day. Typically I will alternate every 20 to 30 minutes from sitting to standing. This has allowed me to work without discomfort and stiffness. I would highly recommend this unit to anyone looking to improve their health by adjusting their work space from sitting to standing.